Normally when the thoughts of children are written on the pavement, it's considered to be graffiti. In Louth it's art, part of a sculpture that spans the town and records the thoughts of Louth schoolchildren about the meridian line. A series of sculptures were installed in Louth, known as the Louth Art Trail, as a way of marking the millenium. The artists involved have tackled their projects in a variety of ways and using different materials, from the abstract work on the top of the Playgoers theatre in Victoria Road, to various human figures cast in bronze. 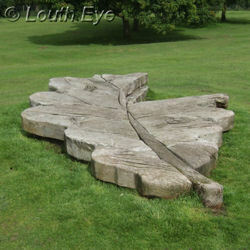 The leaf sculptures in Westgate Fields are huge, and probably best photographed from the air. Made entirely of wood, they are my personal favourite of all the sculptures, partly because they suit their surroundings so well. Spread out over the length and breadth of the town, seeing them all involves a good walk. Candidates for the district and town council elections in the area are officially confirmed, and many seats on the town council are unopposed. Community groups benefit from funding awards, and the council debates how to spend the budget for the annual civic parade. Fire crews are called to a print works at Bolingbroke Road. 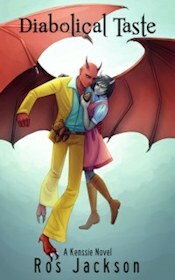 The autumn promises a glut of exciting cultural events. Meanwhile the town risks losing its ambulance station as local provision comes under scrutiny. A plea for help from the Ark, and Louth's summer festivals are all set for re-branding. John Walker presents a nostalgic view of the local beauty spot in his oil painting. Jubilee June will be red, white, and blue, and possibly a little bit green. The market organised by Louth Lions featured all kinds of crafts and local creativity. Planning decisions mean ELDC is moving nearer to generating its own electricity. But will it get a good deal for taxpayers? Members of the strategy games club compete for the title of the best model painter at their Halloween party. 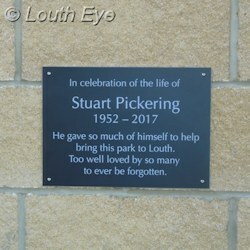 A plaque was unveiled on the side of Meridian Leisure Centre in memory of Stuart Pickering on the official opening day of the X Sports Skate Park. 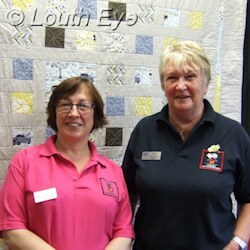 Bev Anderson and Sheila Evans at the Cyril Turner Hall in Ludford for an exhibition by the Lindsey Patchworkers. The festival is both a celebration of local history and an encouragement to get involved in making sure our historic buildings stay in good repair. The parish church of St. James dominates the skyline of the town. It is both a religious and cultural centre, and a work of art in its own right.